Loren Rieseberg, Professor and Canada Research Chair in Plant Evolutionary Genomics, conducts research on the genus Helianthus in his lab at UBC. Today’s photographs of a hybrid sunflower species, Helianthus anomalus, are from the Little Sahara Sand Dunes in Utah, USA and taken by Jason Rick. Prof. Loren Rieseberg has tapped the wild sunflower to explore a classic scientific question: How do new species emerge? To find out, his lab at the University of British Columbia marries molecular experiments with classic field studies to learn how radically different hybrid sunflowers arise and colonize new habitats. Although scientists have long known that wild species hybridize — or mate with plants from different species — most believed that the resulting hybrids were maladjusted, evolutionary dead ends that quickly died out. However, over the past 15 years, Rieseberg has documented the rise of successful wild sunflower hybrids. His lab has compared the genes, physiology, and physical traits of five species: two widespread parental species, Helianthus annuus and Helianthus petiolaris, and three hybrid offspring that evolved between 60,000 and 200,000 years ago. 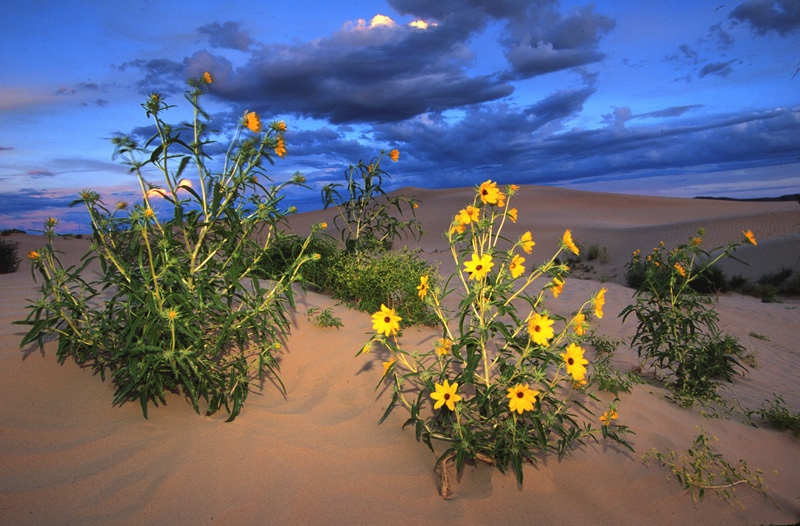 Unlike their parents, the hybrid species — Helianthus anomalus (shown in the photos), Helianthus deserticola, and Helianthus paradoxus — favor extreme habitats: sand dunes, dry desert floor, and salt marshes, respectively. To capture this evolution in action, Rieseberg’s team replicated it by creating their own hybrids of Helianthus annuus and Helianthus petiolaris in the greenhouse. They analyzed the resulting neospecies for the adaptive traits — such as genes that confer salt tolerance or succulent leaves — needed to colonize the extreme habitats of naturally evolved hybrid species. Working with more than 2000 various synthetic hybrid seedlings, they successfully transplanted them in salt marshes in New Mexico and sand dunes or desert floor in Utah. The DNA that drives hybrids is markedly different, too, Rieseberg and colleagues have shown. They used quantitative trait locus mapping — a method that taps molecular markers to find genes responsible for phenotypic traits such as leaf shape and seed size — to determine which combinations of alleles a plant has. Among sunflowers, the researchers confirmed that ordinary parent plants from temperate climates can indeed mate and yield hybrid offspring with hardier combinations of the same genes. These new gene combinations, they concluded, allowed the hybrids to colonize new ecological niches, such as salty and dry habitats. From Brown, K. 2003. No garden-variety biologist. Science 302:1499. This entry is third in a series for UBC Research Week. Wow! Beautiful photos,and interesting write-up. Did you use a filter to make the color of the sky so intense (polarizing, perhaps? ), or was it natural? For the first photograph, I suspect it was a late evening shot taken with either a flash or spotlight on the plants (I tend to think the latter because of the pattern of light). This particular one, I think, is also a slide scan – so it is possible that Velvia film was used, hence the vivid colours. I’m interested in the reproductivity of the hybrids, if anyone knows i.e. if they can reproduce at all, or only with one/both of the parent species, or among each other. Since that whole “definition of a species” thing they try and set in our often doesn’t hold for plants (the Senna’s in australia for example). Daniel is correct that a flash was used in the first photo. The second is entirely natural. However, both shots were taken in the early evening, hence the vivid lighting. Fuji film was used. With respect to reproduction, the hybrid species are fully fertile inter se, but crosses with the parental species are almost completely sterile. That is, they do represent good biological species. I do thank you for the great Photographs today. 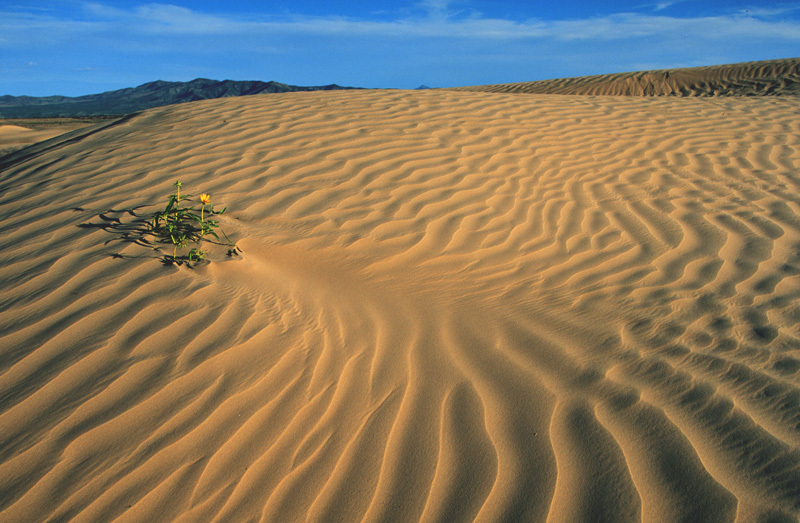 It is hard to even think anything could grow on sand dunes. The patent and flow of the sand and a beautiful plant amist all the driness is a wonder of the world. So I’m confused – are these now considered true species with a known hybrid ancestry? The reason I ask – natural hybrids are written differently from true species. I would expect this plant to be written Helianthus x anomalus if my understanding of botanical nomenclature is correct. Love the vivid colors – we’ve got quite a few more years before digital achieves the look of beloved analog films such as Velvia 50 and Kodachrome 25. Eric in SF, your question got me wondering. It seams to me that this plant was named before it was realized that it was a hybrid. Helianthus x anomalus would be a synonym of Helianthus anomalus and according to the Vienna Code the earlier name takes precedence (APPENDIX I – NAMES OF HYBRIDS Article H.3.3). Eric – that makes it a lot clearer, especially the part about the plant being named before it was known to be of hybrid origin. Thanks for digging through the Code! This whole study bodes well for potentially growing food items in poor soil conditions. Very cool. And beautiful as well.